Receive Outgoing Transmissions straight from Iacon by signing up for the Optimus Rhyme e-mail list. Optimus Rhyme: School the Indie Rockers is Available Now! 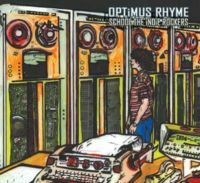 Click here to buy Optimus Rhyme's second full-length album online, or pick up a copy at Sonic Boom or Easy Street Records in Seattle. Like it? Click here to get it online, or pick it up at Sonic Boom in Seattle. Optimus Rhyme is very, very thirsty. It's been hard work thwarting the Wackacon invasion, and now we're ready to toss back some beers at Redhook's Moonlight Cinema Series. First we bust out a set, then they're showing one of Wheelie's favorite flicks, True Romance. You don't have to be 21+ to get in, so we expect everyone who's been complaining about the bar gigs to come out and sneak some beer from OR's pitcher! This year, we form Voltron with AutoBeat allies The Minibosses, MC Frontalot, The NESkimos and The Video Game Pianist to participate in the best gamer gathering known to man. Thanks to Gabe & Tycho for having us back. We'll be slangin' T-shirts and CDs all weekend so be sure to stop by to tickle Stumblebee. We're still working on the lineup, but Friday the 13th on the Ave should be very entertaining. After all, the last time we played Tommy's, Powerthighs was rufied. The year was 2000. The Wackacons had invaded the Emerald City. Parties grew listless and nightclubs suffered greatly under the Wackacons' ever-growing influence. Repetitive loop manufacturers, lackluster DJs and angst-filled metal pushers aligned with the Wackacons and quickly flourished in our once-great city. It was later that year when fate brought four independently minded Autobeat technicians together. Instantly, their positronic brainpaths fused. Within weeks, laid-back progressive hiphop beats were mixed with brutally brain-teasing rhymes. E-Mail your favorite AutoBeat! Just click on the names above. Taking the first step toward local unification, Optimus Rhyme rises from Cyphertron’s junk depot and feels the reassuring pulse of the Matrix. Official ORPPRB rankings reflect sanctioned play, last updated 7/26/06. 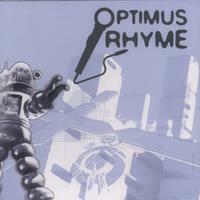 Download the first preview track from Optimus Rhyme's second full-length! Two Wackacon-wasting songs from OR's first full-length.